Manage your inventory and check your supply levels in real-time. Receive optional notifications when specific inventory levels get low. 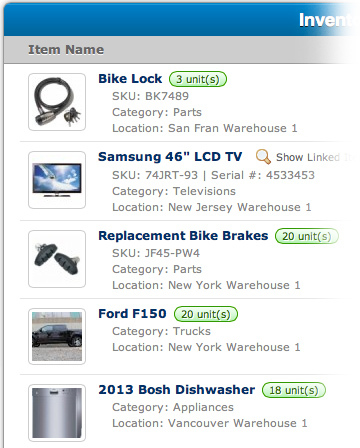 Replenish stock with P.O's and use the "weighted averaged cost"
At a glance, view all the useful data for each item. 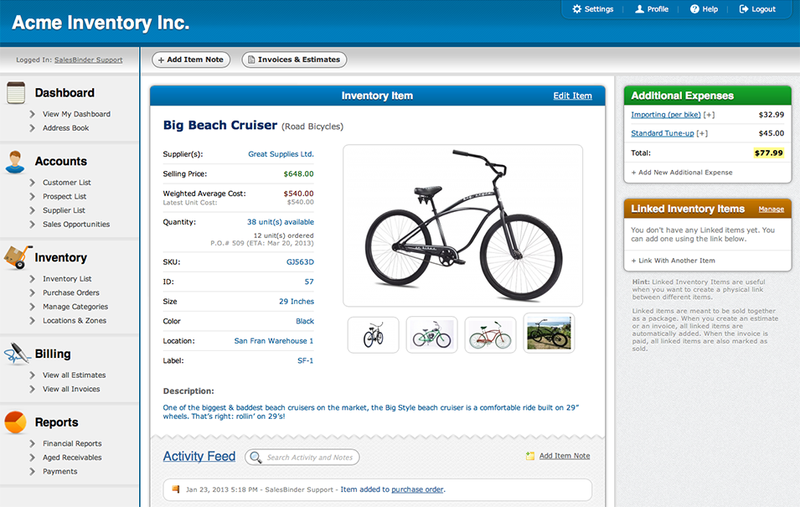 Quickly see everything you need to know about your specific inventory items. Who supplies it, what it's currently selling at, how many you have in stock, how many you have back-ordered in purchase orders and when they're supposed to arrive. 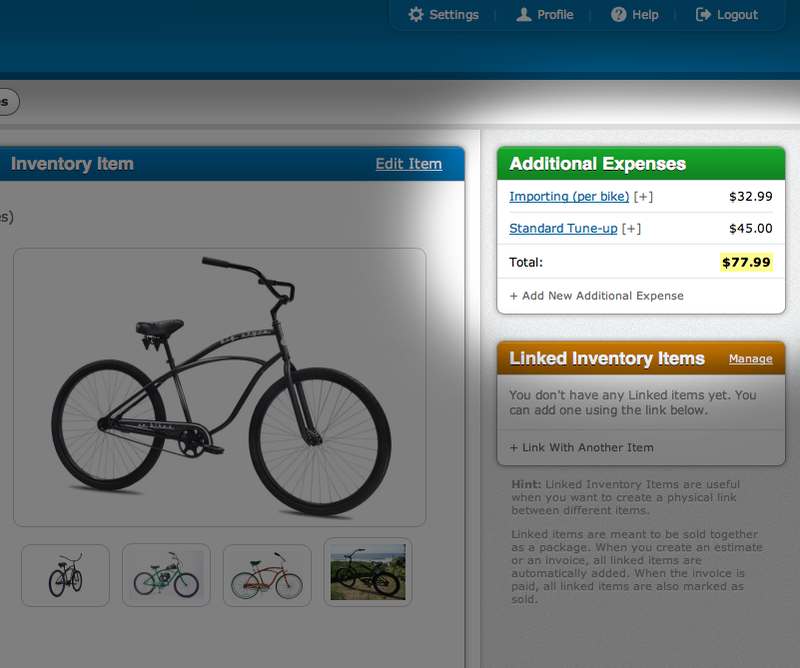 In one click, see if there's any estimates or invoices related to each specific item. 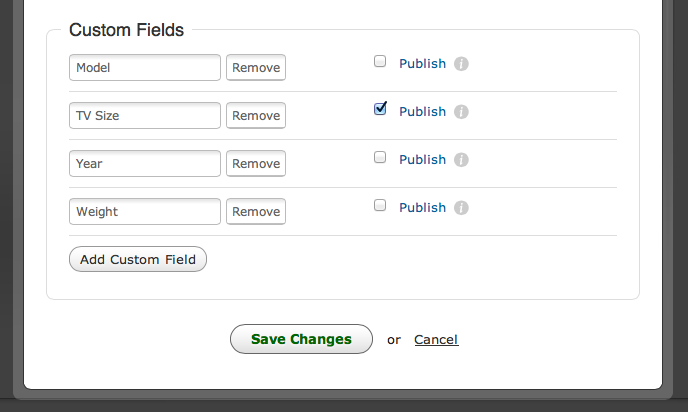 Create as many custom fields as you need. There's no limit! 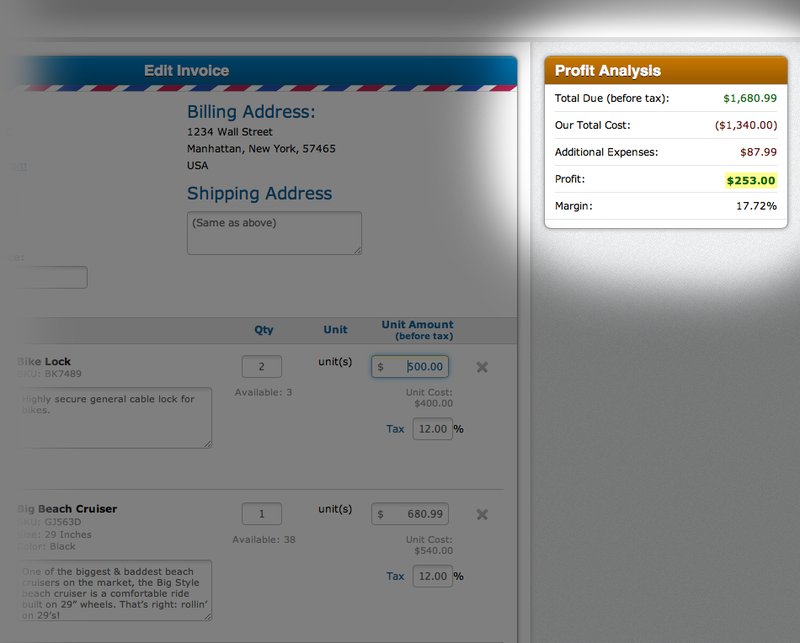 Create a set of custom fields specifically for each of your inventory categories. This allows you to custom tailor what type of data you'd like for each of your unique categories. 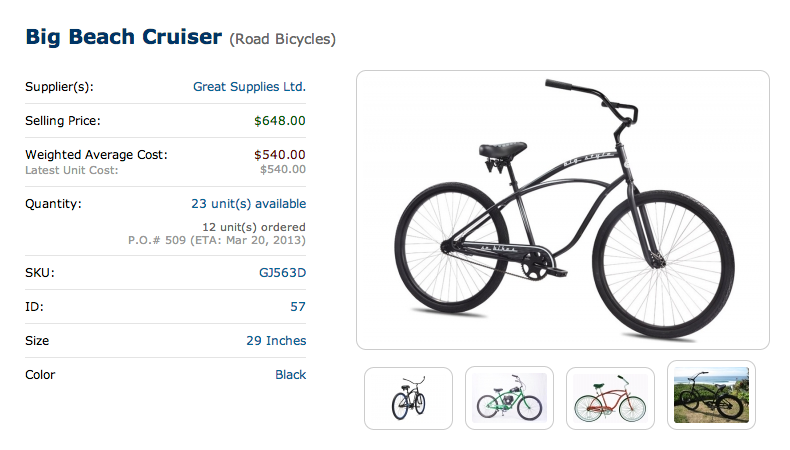 For example, a category for Cars would use different custom fields than a category for Tires. Additionally, you can check whether or not you'd like to display each custom field in your documents (invoices, estimates, p.o's, and packing lists). 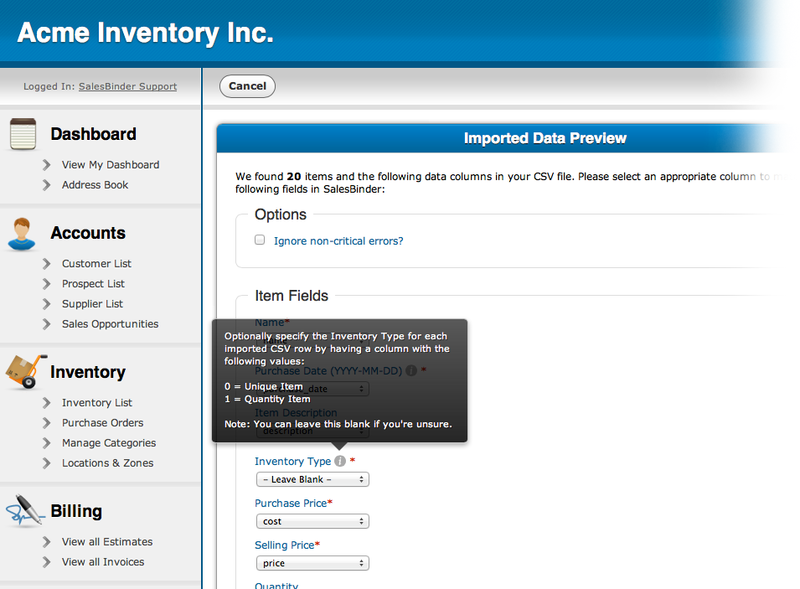 We also support the ability to import your inventory data from CSV files (in any format) and allow you to map your spreadsheet columns to your SalesBinder fields - including all of your custom fields. Enter extra expenses associated with each inventory unit (such as repairs or importing fees) so you can keep track of your real expenses. While creating an estimate or invoice, SalesBinder will present you with your true profit margins so you can play around with your pricing without any surprises. With SalesBinder, you don't have to spend hours preparing your spreadsheets. Just export your spreadsheet as a common CSV file, upload it to SalesBinder, then match which columns are associated to which fields using a sample row of your data.